Try out games for free at Casino Mango! Play and get familiar with your favourite games, including slots, roulette, blackjack, baccarat and more. Filter on game categories or software provider on the right and click on the image to enter the review. From there, you can play the game for free. If you want to find out which games you can play on your mobile phone then be sure to check out our mobile casino section. Please change your search/filtering criteria and try again. Gambling has been around for ages. Archaeological objects show that games have been played for over 5000 years, although it is uncertain if there were in fact any bets in place. Regardless of whether there was anything at stake, these games are considered to be one of the oldest forms of human social contact and have a deep influence on the way our brain works today. It is therefore not surprising that modern gambling items such as dice, roulette wheels, playing cards, and casino chips flying over a velvet table often trigger feelings of excitement, joy, and pleasure in a lot of people. Casinos however have been around since the early 1800s. Before the legalisation in 1960, gambling took on two shapes; the one approved by patents which provided gambling to the nations upper classes, and the unlawful secret gambling for the lower and middle classes. The underground gambling mostly took the form of off-course horse betting. In spite of a powerful anti-gambling lobby, gambling advanced from casual bets among friends to commercial forms provided by bookies and opportunistic entrepreneurs. By 1939 the most popular types were horse betting, greyhound races, and football pools. 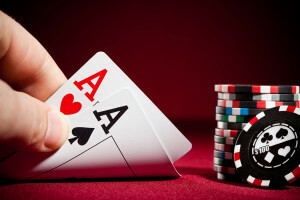 There is some disagreement concerning the establishment that can be regarded as the very first casino, particularly due to the cloudiness of legislation, in combination with the high number of underground gambling clubs. However, Whites – originally opened as a coffee shop by the Italian Francesco Bianco – is often mentioned as one of the first gaming institutions in the United Kingdom as it opened its doors for politicians and royalty in 1652. Afterwards, additional forms of gambling rapidly gained admiration in the United Kingdom, such as blackjack, craps, baccarat, and American style roulette (but with one zero). There is some disagreement among experts about the roots of the vastly popular game of Blackjack, most signs though point too early 18th century French casinos, where it was known as Vingt-et-Un, which is French for twenty-one. During the centuries the game has advanced into one of the most liked casino games in existence, together with roulette and baccarat. Because of this popularity you will find many forms and differences in strategies and risk-taking behaviour in general. The core goal is always to get 21 points; each form has its own particulars that asks for strategic adjustments of the player. Even with perfect strategy the house will have an edge of 65 to 17% depending on the rules. Roulette, also known as ‘little wheel’ is another popular game which definitely originated in France, unquestionably one of the most favoured games that you will find in the casino. The wheel was invented by coincidence by the French mathematician Blaise Pascal during his quest for a perpetual motion machine. Roulette’s popularity gave rise to a number of variations and subsequent strategies. Two main forms are European Roulette and American Roulette, played with one and two zeroes, respectively. Slot machines, which were developed in the U.S. in 1891, are a great way to escape your daily routine and to slip into a fantasy world. With the press of a single button you can get lost in the wondrous world of ancient Egypt with Book of Ra, or you can become a Norse god in pursuit of a huge jackpot with Hall of Gods. Slots machines are gaining immense popularity on the Internet not only because of the ease of game but also because of the variety, as there are literally thousands of games and genres available. No strategy or knowledge is needed because everybody can pull that virtual lever, enjoy the game, and hope that good fortune is waiting on the other side! More information on what the game is all about and what the pay-out percentage per game is can be found in the game reviews.